It's a record 200 sales so far this year as Raymond Young at RJC Yachts finds a buyer for the 30.4m motor yacht Triple Attraction, listed for sale by Lon McClosky at Worth Avenue Yachts. The news is significant in that it wasn't until the end of July in 2013 that the figure of 200 sales was achieved, so the industry is currently over a month ahead of last year's results. Designed by Jack Hargrave, Triple Attraction was built by US superyacht yard Hatteras Yachts and delivered in 2005 as one of the most highly customized yachts from the yard to date with every conceivable large yacht option. She has a spacious main saloon, formal dining area, gourmet ‘country kitchen’ galley and oversized aft deck. The flybridge has a bar and Jacuzzi, offering al fresco entertainment and dining. Other features include an on board waste treatment system as well as underwater lights. A gorgeous interior in satin cherry wood throughout accommodates 10 guests in five staterooms. These comprise a master suite, VIP suite, two double staterooms and a twin cabin, all with en suite facilities. Rarely does a yacht this size offer so much space so she would be an ideal charter proposition, although she has been used only privately to date. 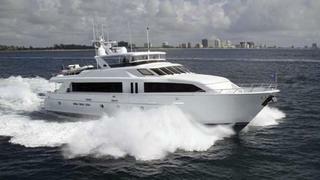 Twin 2,000hp MTU engines give her a cruising speed of 20 knots and maximum speed of 24 knots. Now renamed Crescendo, Triple Attraction was asking $4,195,000.